ncl. accessories, warranty card, manual, EC declaration of conformity, 2 years warranty on the boat, as well as all attachments, 5 years warranty on the boat skin. The ideal boat for longer sessions! - Strongest Hightech PVC material characterise these iBoats! They are equipped with a high pressure floor, double stroke high pressure pump, Oversize transport bag, solid iBoat Cover, Inox D-Ring with handgrip at the bow, 2 paddles, 2 seats incl. bank-easy-on-off system and sliding system (Multiposition), reparation kit, spare valve, manometer and a Fender-Expander Kit. How big is the iBoat in rolled condition? How big is the boat in inflated condition? What weight does the iboat 260 have? What is the maximum vehicle load capacity of the iboat? What is the maximum motorization of the iboat? What is the optimal inflation pressure? What does delivery cost when pre-paying? The large interior is achieved through shorter cones (the transom is displaced to the back), some more width and following the pattern as long as possible straight buoyancy collars, that merge at the last moment to the bow! So we nearly achieve the internal space of a considered 320 boat at a 260 iboat! Rod Pods at the iBoat? The choice of rubber boats is huge. This gave the redaction team of Carpzilla the challenge to compare the actual boats. 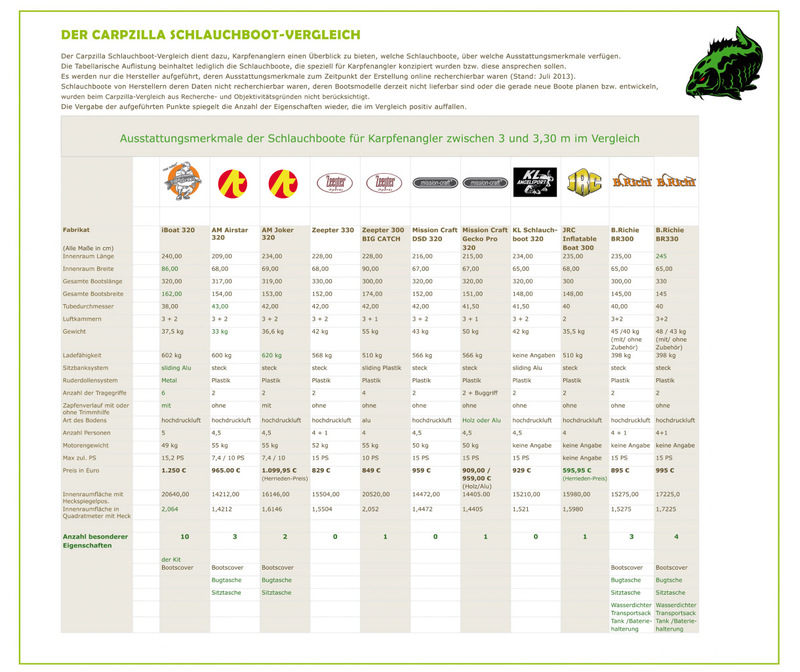 Carpzilla gives you a nice review- which boat is the right one for you?